If there’s one word that describes Muse’s music, it is ‘Intense’. You know what you’re getting with this band, no matter which album you pick up: heavy, unrelenting, biting music … that’s as dark as the night sky and hasn’t got an ounce of optimism in it. If I’d actually looked beyond my obsession with The Smiths when I was a sulking adolescent, I’d have eaten this stuff up, for Muse make The Smiths look like KC and The Sunshine Band. So, if you’re into your misery music, like me, Muse are utterly brilliant. If you’re not, look away now. Comparisons to early Radiohead have always surrounded Muse, but I think it’s fair to say that Showbiz is an infinitely more impressive début than Pablo Honey, and although not as melodically strong as The Bends, it’s certainly more experimental – both structurally and instrumentally. The great thing about Muse is that even if a track isn’t particularly strong (see the bland Falling Down, and lacklustre Overdue on this album) there’s always something in the mix to keep the listener interested. These fellas really, really know how to play their instruments, and Matt Bellamy’s guitar work is often truly magnificent, especially as he demonstrates his talents not through showy solos, but via tiny flourishes that bolster the songs rather than take centre stage. There are some flashes of brilliance on Showbiz (see Cave and Unintended), but some flabby tracks prevent it from being a great album. 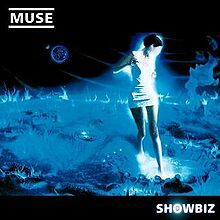 Unlike numerous modern bands that peak with their début and have nothing else to offer, however, Muse have got stronger and stronger over the years, and, much like Please Please Me, Showbiz simply hints at the talents of a band yet to reach its creative peak.